Paraneoplastic demyelination is a rare disorder of the central nervous system. We describe a 60-year-old man with tumefactive demyelination who had an underlying retroperitoneal germ cell cancer. He presented with visuospatial problems and memory loss and had a visual field defect. His MRI was interpreted as a glioma but stereotactic biopsy showed active demyelination. Investigation for multiple sclerosis was negative but CT imaging showed retroperitoneal lymphadenopathy, and nodal biopsy confirmed a combined germ cell cancer. He responded poorly to corticosteroid treatment, and his visual field defect progressed. However, 6 months after plasma exchange and successful chemotherapy, he has partially improved clinically and radiographically. Tumefactive demyelination is typically associated with multiple sclerosis but may be paraneoplastic. It is important to recognise paraneoplastic tumefactive demyelination early, as the neurological outcome relies on treating the associated malignancy. Focal tumefactive demyelination of the central nervous system (CNS) is uncommon. It usually occurs in the context of multiple sclerosis, affecting one to two per 1000 cases, manifesting as an enhancing lesion on imaging that mimics a neoplasm.1 It gives symptoms more typical of a space-occupying lesion than of multiple sclerosis, such as seizures and focal neurological deficit. Many patients presenting with a solitary lesion do not progress to multiple sclerosis and clinicians should consider other causes.2 We describe tumefactive demyelination as a paraneoplastic disorder in a patient subsequently found to have a combined germ cell tumour. A previously healthy 60-year-old right-handed man gave a 4-week history of visuospatial problems and memory loss. He worked as a machine engineer and had difficulty following and carrying out written and pictorial instructions. He struggled with simple arithmetic and with operating everyday objects, such as a microwave. His partner had noticed his memory had worsened over 6 months. On examination, there was an homonymous right upper quadrantanopia and oculomotor apraxia but no optic ataxia. His fundi and remaining neurological examination were normal. His Addenbrookes Cognitive Examination score was 39/100, with severe deficits in fluency, memory and visuospatial domains. MR scan of brain showed a large confluent lesion affecting both occipitoparietal lobes, crossing the splenium of the corpus callosum (figure 1A). At this point, our most likely diagnosis was glioma or lymphoma. He started dexamethasone 4 mg twice daily. Image-guided biopsy (figure 2) showed active demyelination with hypercellular white matter, a dense infiltrate of CD68-positive foamy macrophages, some containing myelin debris, and scattered CD45+ and CD3+ lymphocytes but no evidence of neoplasia. MRI time course. (A) One week after presentation: an axial T2-weighted image shows a bilateral occipitoparietal confluent hyperintense lesion crossing the splenium of the corpus callosum, with mass effect. T1 postgadolinium images (not shown) showed low signal intensity and patchy enhancement at the periphery of the lesion. (B) Two weeks after intravenous methylprednisolone and plasma exchange there is some evidence of regression. (C) Six months later repeat imaging showed an indolent lesion with significant white matter atrophy, gliosis and compensatory ventricular dilatation. (A) The brain biopsy showed hypercellular white matter, infiltrated by foamy macrophages. (B) A few macrophages contained myelin debris, appearing as clusters of blue membranes and granules in this section stained with solochrome cyanine. (C) There was reasonable axon preservation but immunohistochemistry for neurofilament protein showed a few axonal spheroids. (D) The macrophages could be labelled with antibody to CD68. (E) Antibody to glial fibrillary acidic protein labelled reactive astrocytes within the white matter, but not the foamy cells (macrophages). (F) Scattered CD3-positive T cells within the demyelinated white matter (bar=50μm). In the 4 weeks following his presentation, his visual field defect progressed to a right homonymous hemianopia (figure 3A). We stopped his oral corticosteroids and gave a 3-day course of intravenous methylprednisolone 1 g daily. An autoimmune profile including anti-neutrophil cytoplasmic antibody, extractable nuclear antigen, ACE, lupus anticoagulant and rheumatoid factor was normal. Lyme, syphilis and HIV serology and an extended paraneoplastic screen including serum antibodies to Purkinje (Yo), ANNA-1 (Hu) and ANNA-2 (Ri) were also negative. Cerebrospinal fluid (CSF) was normal, with no oligoclonal bands or abnormal cells. The amplitudes of visual evoked potentials were moderately dispersed and reduced bilaterally. CT scan of abdomen showed multiple enlarged, partly necrotic retroperitoneal nodes, suggesting lymphoma or metastases. Subsequent inguinal node biopsy showed infiltration by sheets of tumour cells with large nuclei and occasional prominent nucleoli (figure 4). The cells were immunopositive for placental alkaline phosphatase, CD117 and OCT3/4, but not cytokeratins, melan A, S100 protein, CD20, CD68, TTF-1 or prostate-specific antigen. These findings suggested a pure seminoma. However, further investigation included an elevated serum α-fetoprotein concentration (129 kIU/L) without an alternative cause, suggesting additional non-seminomatous elements. Therefore, we suspected a combined germ cell cancer. Testicular ultrasonography was normal, and we thought the abdomen was its likely site of origin. Humphrey visual field time course. (A) Four weeks after presentation, (B) 1 week after intravenous methylprednisolone and (C) 6 months later. L, left; R, right. (A) The nodal biopsy showed sheets of tumour cells with large nuclei, some containing prominent nucleoli. (B) Sheets of normal-looking lymphocytes at the edge of the tumour. (C) Immunopositivity of the tumour for placental acid phosphatase, (D) OCT3/4 and (E) CD117. (F) Antibody to vimentin labelled the normal lymphocytes and vascular cells but not the tumour cells (bar=50 μm). Repeated visual testing a week after intravenous methylprednisolone showed significant progression of the field defect and worsening acuity, although he had not noticed visual deterioration (figure 3B). We restarted dexamethasone 4 mg twice daily and plasma exchange therapy 3 days later. He received five plasma exchanges in 10 days using human albumin and saline. One plasma volume was exchanged each time with no reported complications. He started a course of four cycles of cisplatin and etoposide to treat the underlying malignancy. A restaging CT scan 4 months later showed almost complete resolution of his retroperitoneal disease and his serum α-fetoprotein had become normal. Repeat MR scans of the brain at 2 and 17 weeks after plasma exchange showed mildly reduced mass effect and size of the lesion (figure 1B). Further imaging at 6 months showed an indolent lesion with no active demyelination or mass effect (figure 1C). There was, however, significant white matter atrophy with residual gliotic changes and compensatory dilatation of the occipital horns of the ventricles. In line with this radiographic improvement, his visual field defect had significantly regressed (figure 3C). Addenbrookes Cognitive Examination at 9 months had also improved, with a total score of 56/100 compared with 39/100 at 1 month. While he still had profound memory impairment, both language and visuospatial domains improved. The patient himself reported slow progress; he could not return to work but acknowledged improvement in his ability to read and perform basic tasks at home. Diffusion-weighted imaging 1 week after presentation. (A) Peripheral high signal was noted on the B1000 series with (B) low signal on the apparent diffusion coefficient map, in keeping with restricted diffusion at the lesion margins. Although tumefactive demyelination occurs most commonly as a manifestation of multiple sclerosis, other pathologies need excluding (table 1). Tumefactive demyelination can also occur as a clinically isolated syndrome without obvious cause. In a patient with imaging features suggesting tumefactive demyelination, and with no alternative detected cause, the first treatment should be with corticosteroids, with reimaging at 6–8 weeks. 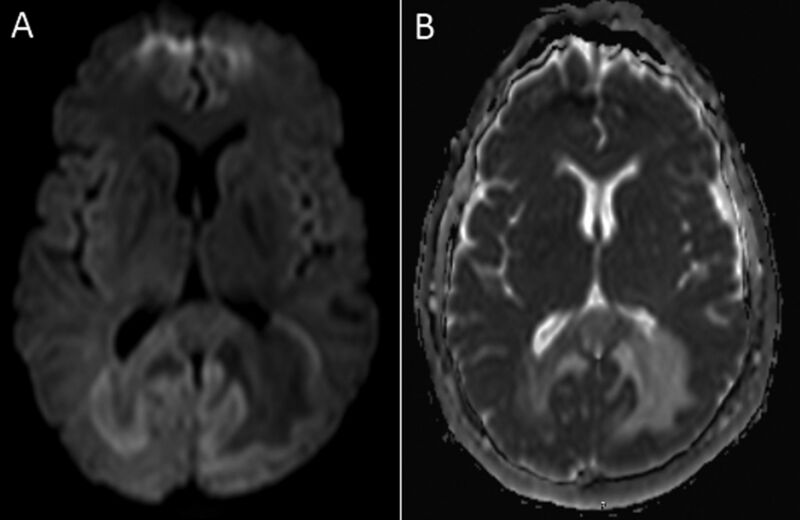 A recent review gave a useful protocol for its clinical management.1 However, many patients need stereotactic brain biopsy to confirm the diagnosis, especially if the imaging is inconclusive, CSF oligoclonal bands are negative or if the patient is from a group where multiple sclerosis is unlikely, such as this case. Demyelination as a paraneoplastic phenomenon is uncommon. Onconeural antibodies are rare, and the paraneoplastic hypothesis often rests solely on the close temporal association of demyelination and malignancy.8 Tumefactive demyelination in the context of malignancy is very rare. 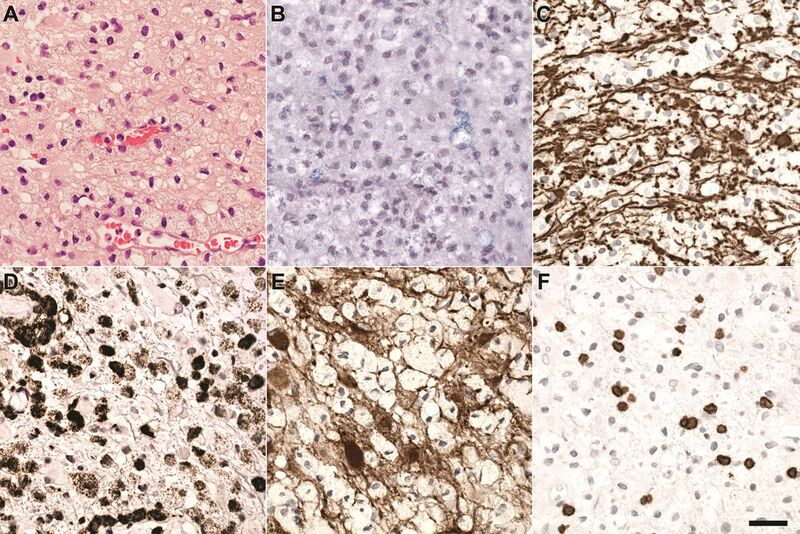 In a review of 31 cases of focal tumefactive demyelination in the brain, Kepes2 described three patients with concurrent malignancy: one with retroperitoneal seminoma, one with chronic monomyelogenous leukaemia and a third patient with cerebral immunoblastic sarcoma.9 There are two other reports of cerebral demyelination associated with seminoma10 ,11 and a small number of cases occurring in the context of CNS lymphoma.12 ,13 Hane et al14 also described a patient with recurrent tumefactive demyelination and renal cell carcinoma. In the three previous reports of cases with germ cell cancer, the patients were aged 41–68 years. One had multiple foci of demyelination and diffuse cerebral atrophy,11 while the other two each had a single tumefactive lesion, as in our case.9 ,10 Both of these patients received corticosteroid therapy and treatment of the underlying malignancy, but only one showed significant neurological improvement, with no recurrence of CNS lesions after 5 years. Our patient's condition has stabilised when compared with these cases. Although he did not respond initially to corticosteroids, there was partial clinical and radiographic improvement following plasma exchange and successful chemotherapy. The extent of his neurological response did not reflect the resolution of malignancy, but this may have been limited by residual irreversible cerebral atrophy. Tumefactive cerebral demyelination is an important but rare paraneoplastic phenomenon, in this case related to combined germ cell cancer. Tumefactive demyelination may result from multiple sclerosis, autoimmune or infective causes, but malignancy should be considered particularly where cerebrospinal fluid oligoclonal bands are negative and the patient group is not typical for multiple sclerosis. Imaging findings suggesting tumefactive demyelination rather than cerebral malignancy include open ring enhancement, disproportionately low mass effect and peripheral diffusion restriction; stereotactic biopsy should be strongly considered where imaging is inconclusive and multiple sclerosis is unlikely. It is important to recognise paraneoplastic tumefactive demyelination early, as the outcome depends on successful treatment of the underlying malignancy; immune therapy may also help and plasma exchange may be useful in corticosteroid-resistant cases.
. Paraneoplastic syndrome simulating encephalitis in the course of testicular seminoma. Folia Neuropathol 1997;35:24–8. Contributors JRB is the lead writer of the report. HAA reviewed and revised each draft. EC is the patient's consultant neurologist and reviewed the final draft. APAA is a consultant neuroradiologist and provided images and captions for the report. 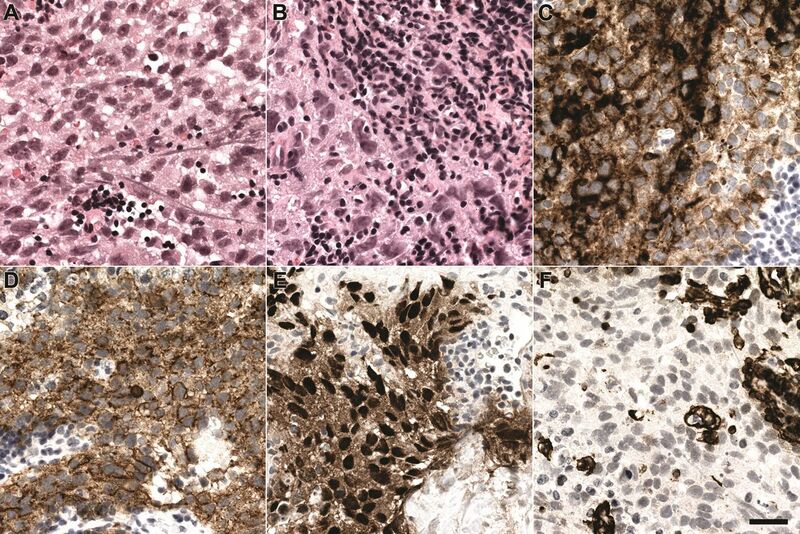 JS and SL are neuropathology consultants and provided images for the report and contributed descriptions of histology. JPB is the patient's consultant oncologist and revised the final draft. Provenance and peer review Not commissioned; externally peer reviewed. This paper was reviewed by Neil Anderson, Auckland, New Zealand.